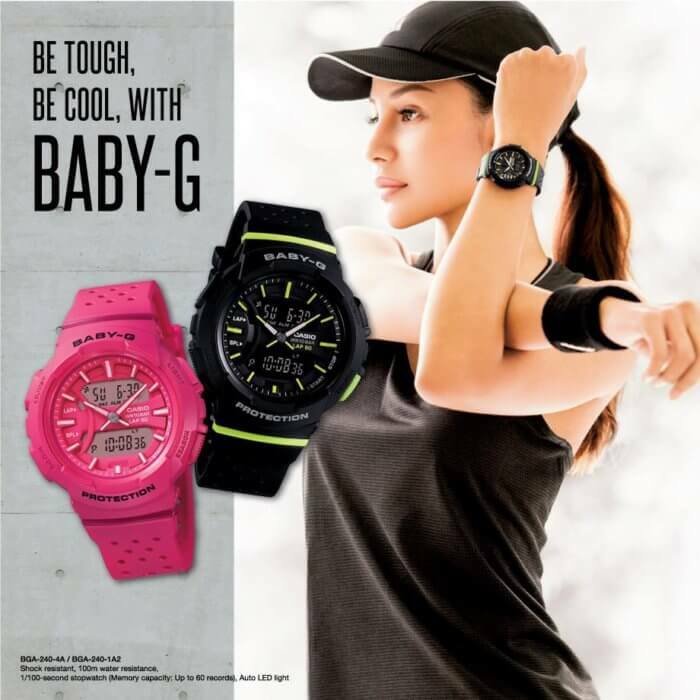 An all new Casio Baby-G watch designed for running is coming to Japan in March. The Baby-G BGA-240 is an analog-digital model available in sportswear-matching colors. The bands have large holes in them for breathability and the watch has an arm protector on the backside. Two LCD subdisplays can display the date and time simultaneously or a second time zone. A unique feature for running is the stopwatch that measures lap and split times and the stopwatch memory that holds up to 60 measurements. Other features include shock resistance, 100-meter water resistance, 24-hour countdown timer, 3 alarms with 1 snooze alarm, and auto LED light with afterglow. The BGA-240 measures 46.4 × 42.6 × 15.3 mm and weighs about 41 grams. Color options are the black BGA-240-1A1, black and lime green BGA-240-1A2, pink BGA-240-4A, and white BGA-240-7A. List price is ¥13,000 JPY. Baby-G Japan also launched a new Tough Solar/Multi-Band 6 Baby-G model for February. The BGA-1050 is an analog-digital model featuring a stainless steel bezel and a LCD display that displays the date or world time. The bezel is reminiscent of the BGA-220 and BGA-2200 series, but the BGA-1050 is smaller at 42.6 mm wide versus 45.5 mm. The BGA-1050 is a continuation of the BGA-1020 line (amazon), the difference being a more conservative face design without the heart. The BGA-1050 is a Japan-only release, but it is worth mentioning as it has a simpler and more subdued design than most solar Baby-G watches. Models include the black BGA-1050B-1BJF with black IP bezel, the pink BGA-1050-4BJF, and the white BGA-1050-7BJF. List price is ¥23,000 JPY for the BGA-1050B-1BJF and ¥22,000 JPY for the BGA-1050-4BJF and BGA-1050-7BJF. Features include shock resistance, 100-meter water resistance, neo-brite luminous hands, world time, stopwatch, timer, battery indicator display, power saving function, and LED light with afterglow.